Wrinkles, you’ve got them. Bed bugs and other pests? You hate them. Allergens, germs, and other too-small-for-the-eye-to-see harmful substances? You bet they’re sticking around your home ready to work their dastardly deeds. While all of these things are present in your home, you can bet that your home is far better off without them. But here’s the good part: one simple tool can get rid of all of these unwanted things. And it will do it in a way that isn’t going to hurt any of the surfaces in your house. This versatile, easy-to-use tool is the steam cleaner and we can’t say enough about how many ways to use a steam cleaner around your home to turn it into a decently clean space to absolutely flawless. 1 What’s a Steam Cleaner? 2 How Many Ways to Use a Steam Cleaning gadget? A steam cleaner is – well, a cleaner that uses steam. It looks a lot like a vacuum cleaner with a detachable head but instead of sucking in air, it will push out steam. You put water into its tank, plug it in, and turn it on. The heater in your unit will then heat the water to create steam that comes out of the nozzle at the head – the part that you hold in your hand to control where the steam goes. In this way, you can point the powerful steam that is generated by your cleaner directly at the spots that you want de-wrinkled, sanitized, or otherwise cleaned. We love to emphasize the fact that a steam-cleaner has a sanitizing effect that no other appliance can even come close to. With other cleaning methods, you most often have to rely on chemical substances that will wear out your surfaces over time or sting your nose or do who knows what to your home and kids. 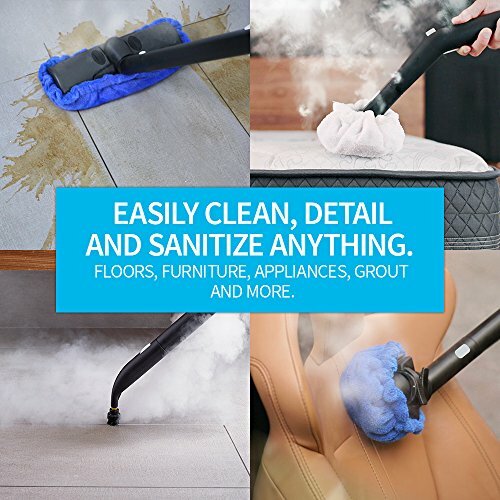 But, with a steam-cleaner, you get an all-natural sanitizing effect that is just as effective as any other method of cleaning – without the need for chemicals. We love it and you will, too. How Many Ways to Use a Steam Cleaning gadget? This is probably our favorite household reason for loving our steam cleaner so much out of how many ways to use a cleaner that there are. Bedding can be a bit annoying to clean with the whole stripping-it-down process, throwing it in the washer and dryer, and having to dress the bed back up. Now, if you want a quick clean for your bed, you can simply run your steam cleaner over it. What we love most about this method is how easily it gets rid of bed bugs. The high temperature of the steam kills off these disgusting pests so that you can sleep soundly through the night once again. As we have previously mentioned, it will also get rid of allergens and other unwanted microscopic substances, too. Cleaning the kitchen can be a bit of a hassle, we know. But now that you have your steam vaccum around, it’s as easy as the pie you just baked. Flip the switch, let the steam flow, and, next thing you know, your kitchen will be as clean as the day you bought your home. Getting the type of clean you are looking for in your kitchen can be a little difficult with all of the nooks and crannies in there, right? Luckily, a steamcleaner can get right into those spots to clean and sanitize every inch and surface in a kitchen. If you have hard flooring, you know just how difficult it can be to keep it clean and looking the way you want it. You know what it’s like to walk across your living room and realize that the bottom of your foot has now turned black. Yeah, it’s past the time to run the steam mop again. Again, it’s the sanitization without needing chemicals that wins us over here. Your floors don’t like abrasive and caustic chemicals being used against their surfaces and, over time, you will see your flooring start to feel the sting. 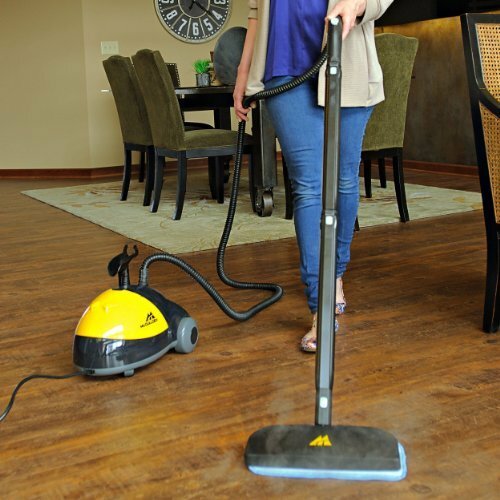 With a steam mop, your floor could last as long as your house still stands. Cleaning furniture is sometimes an art that gets forgotten around the house. You’ll clean everything else around it but…How do you clean the furniture? With your steam-cleaner machine, of course! As always, no chemicals, all clean, and just so easy. Think about it. You spend so much time on your furniture and yet it can be one of the few things that don’t get deeply cleaned while you are sprucing up the place. 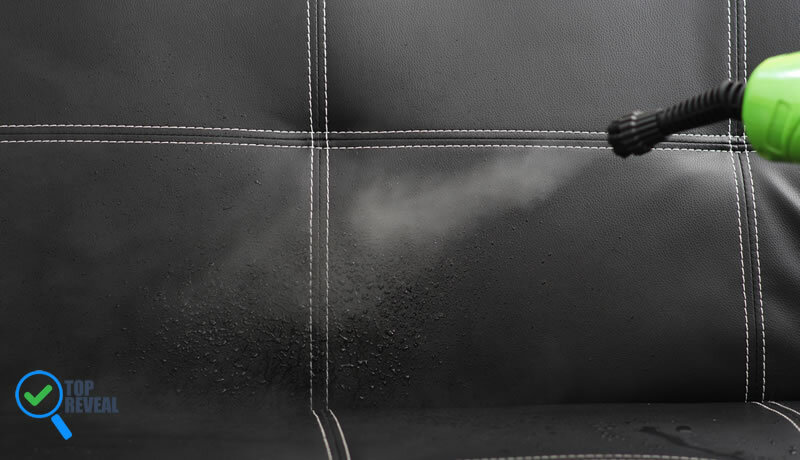 That can all change with a steam cleaner around because you can effectively clean nearly any furniture fabric with the ease that comes with a vacuum cleaner. Scrubbing windows can be an absolute pain, especially if you have a beautiful home with a lot of them. Wiping down all of your windows gives your home that nice polished look but…Who really wants to go through it? Well, your steam-cleaner does if you haven’t realized it and it will make cleaning tons of windows extremely easy. The best part about this is that you won’t need to go to the store and get one specific chemical substance for getting windows clean. Just pull out your steam cleaner and use it like you were with all of the rest of your surfaces. And, believe us, the shine is just as impressive as any other method for cleaning windows. If not, it’s better. The thing about how many ways to use a carpet cleaning machine that there are is that we can’t even get them all onto one page. These machines are so versatile that you will find yourself wanting to use it in just about every cleaning situation that you can find. A few that we didn’t even get to mention: cars, fixtures, clothes, barbecues, freezers, curtains, carpets…The list goes on and on, folks.